Stuntman is probably one of the most impressive and original car games to hit the console world in a long time. For those that are familiar with the games Destruction Derby and Driver, game developer Reflection have upped the ante with this awesome car game that is a cross between Driver meets Hollywood. 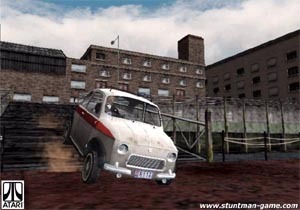 Although the premise behind Stuntman may sound simplistic as most car games are, Stuntman is much more in-depth than your basic destruction car game. You play the role of a professional stuntman who has been hired by a movie studio to perform various stunts on different movies world wide. This is where the beauty of the game shines through as the developers have gone to extreme lengths to keep the game original with plenty of variety on all levels. Before each level starts, you are treated to some impressive cinematics that explain your current movie project and the basics behind the stunt you are about to perform. The basic gameplay of the game is that you must perform certain stunts and technics throughout the game in order to proceed to the next level or stunt. For example, when you start driving, arrows will point in the direction that you must drive and a radio will tell you perform certain tricks such as hitting boxes with the car or driving up stairs etc. These stunts are time based and if you fail to pull off a particular stunt, you will lose valuable time and may not make it to the next check point. As a motivation, the better you perform (against the clock), the higher rewards you get such as money and various bonuses that can be used in the stunt constructor mode. The game itself takes up a whopping 768 kilobytes on the memory card which is almost 1/10 of your 8MB memory card. The reason for this is that each replay is recorded onto the memory card (real time) and will let you change camera angles when you replay your stunts. After completing a movie, you are given the pleasure of watching your handwork in the trailers, showing your best stunts. Easily one of the most impressive replays ever created. There are various gameplay modes that range from Precision Racing, Timing Runs and Stunt Constructor Mode. You are also treated to some other bonuses when you have completed career mode. The Stunt Constructor Mode lets you create your own stunts in a extremely large stadium. 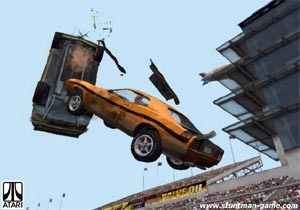 You can create some outrageous stunts that involve huge ramps and lots of destroyable objects. As mentioned earlier, once you complete a stunt in career mode, this opens up more objects in Stunt Constructor Mode such as new cars and stunt equipment. Stuntman is probably one of the most addictive and fun games around but can also be the most frustrating games of all time. The career mode is not very friendly when it comes to time and sometimes you can just miss out on finishing the level because you crashed into the wall one too many times. Unfortunately this cannot be fixed, the only way is by practicing each level over and over again until you have mastered it. It would have been nice if there was an option to set difficulty in the game because this will annoy quite a few people. Fortunately the game is rather easy to master and you only really need to use accelerate and hand brake most of the time. Once you have the gameplay down pat, you will be completing levels in no time but the frustration will always be there because one wrong move and you have to restart the level. The biggest problem that Stuntman has is the extremely slow load times. Most games start instantaneously when you restart levels but with Stuntman, you might want to consider refilling your cup with your favourite drink. Graphically speaking Stuntman is an extremely nice looking game that has quite a bit going on in the backgrounds. As with the movies, there are plenty of cars and pedestrians in the background that all interact with the game. The game itself uses a modified version of the Driver engine that has been revamped for the power of the PlayStation 2. All the car models have a fairly high polygon count and backgrounds are extremely well modelled to give that realistic effect. With so much moving on screen at once and with quite a bit of destructible objects lying around, the frame rate does sometimes suffer but it can be forgiven for the extremely high detail of the game. Stuntman also performs highly on the sound and music front. 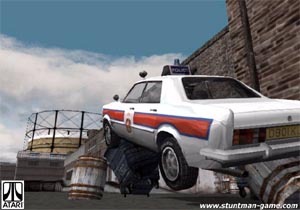 The game contains all the right Hollywood type sound effects such as cars slamming into walls, the screeching of brakes and other fun effects that make you want to play Stuntman more and more. The voice acting has all been professionally done and doesn't come across as cheap as some games do. 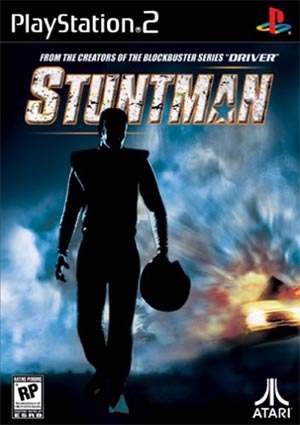 Apart from the professional sound effects and voice acting, Stuntman does have some great background scores to keep the atmosphere of the game rolling. In conclusion, Stuntman is a game that promises much and actually delivers these promises very well. It does have a few bugs here and there but it's a car game with a difference and that is what the industry is lacking at the moment. An awesome game that must be checked out.